The innovative Zero.1 Elite is a 360° rotatable i-Size child seat suitable for use from birth up to four years old / 105 cm (Maximum 18kg). The Elite model features a removable infant carrier for newborn babies which can be used up to 76cm (maximum 9kg). 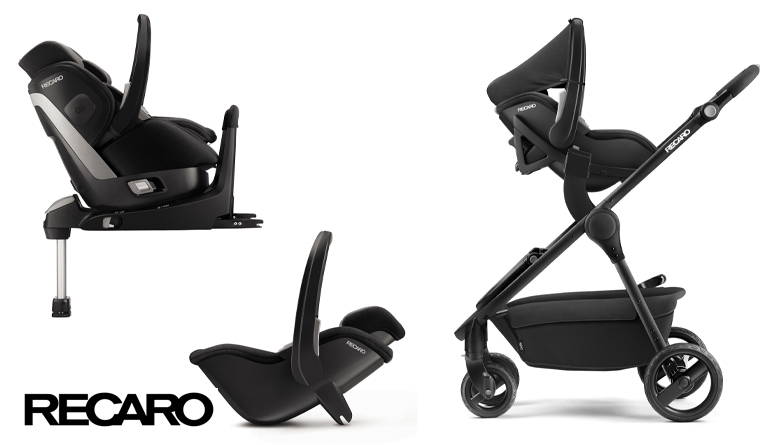 The Zero.1 Elite allows children to travel rearward facing from birth up to four years old; alternatively, the seat can be put into the forward facing position once the child has reached 15 months old. The 360° rotation provides parents with easy access to secure and remove their child from the seat, without having to lean over the Zero.1. The removable carrier secures onto internal fittings within the seat, providing versatility whereby it can used within the main seat for the early stages, be removed and used on a range of manufacturers’ strollers or easily taken into the home without causing any disruption. Ultimate comfort is provided through deep padded ergonomic foam, three recline positions and a six position height adjustable headrest. The RECARO HERO safety system is in place with a five point harness; the shoulder padding, harness straps and headrest form one unit to prevent slipping or twisting of the straps. The Zero.1 features advanced side impact protection and the integrated isofix base features a panel of safety indicators which confirm the correct installation. Note: The Zero.1 is an i-Size compliant seat and therefore requires isofix points for installation into the vehicle. The seat cannot be installed with the vehicle’s three point belt. NOTE: The prize is a Zero.1 Elite stroller RRP of £325 and the other two items that are mentioned (Privia and the Carry cot, are not part of the prize). HI Mark Sorry you have had problems entering our competition. It was an technical update issue, changes by WordPress knocked our own system out of sync.